Two bridal showers in two weeks! Jamie and I sure have been busy. 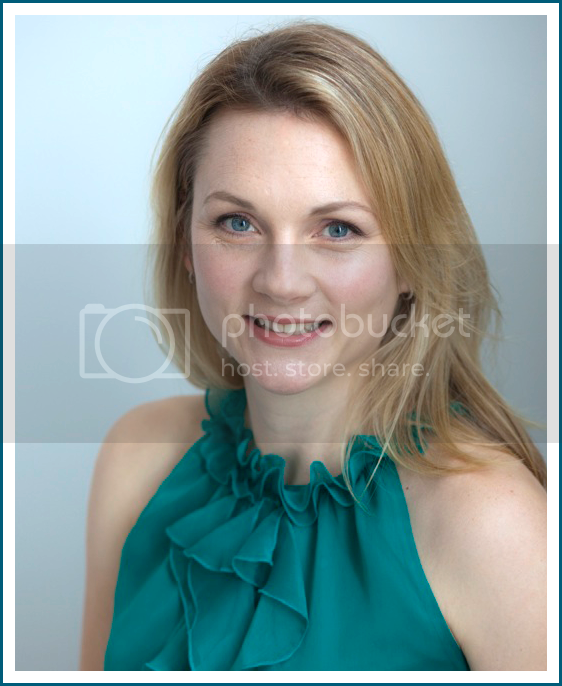 Yesterday Jamie blogged about her friend Julia's shower, which was held two weeks ago. And just this past Sunday, Jamie and I styled a shower for our client, Sheila. Sheila's niece is getting married in the Fall, and Sheila was kind enough to offer up her home and host a bridal shower for about 50 members of the bride's family. Not a small feat! Sheila enlisted our help with the decor, and you know we were all about it. 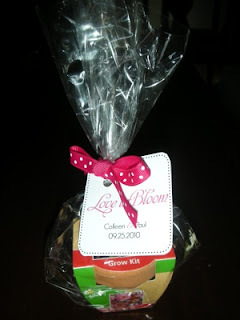 We love bridal showers to begin with ... but in this case, our client had a beautiful home, she and her family were warm and kind, and oh-my-goodness: did I mention it was 74 degrees and sunny on the shower day? How lucky can two event stylists be?!? 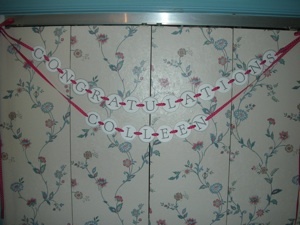 Jamie and I created several projects for the shower and decorated the space a few hours before the party began. Because the weather was so unbelievably perfect, Sheila made the no-brainer decision to have as much of the party outside as possible. 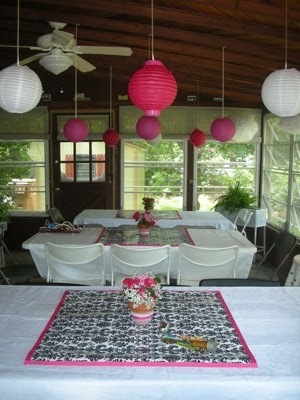 The bride's wedding colors are black and fuchsia, so Sheila opted to go with those colors for the shower. That was our starting point. 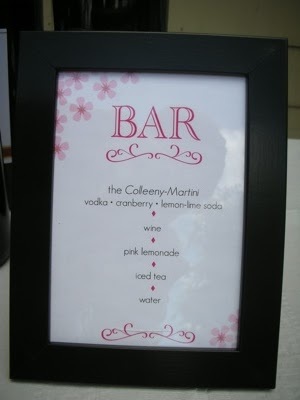 Jamie and I made custom black & white damask printed runners trimmed in fuchsia grosgrain ribbon for the tables, favor tags for the favors (which were the cutest little terracotta pots with flower seeds inside, snagged from Target's Dollar Spot), a custom "congratulations" banner for the entryway and a custom sign for the bar, which listed what the bar had to offer. 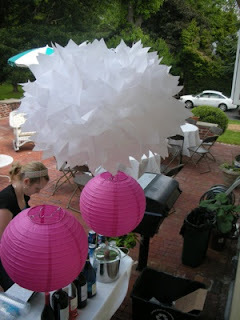 For decor, we really, really and I mean really love paper lanterns for showers & parties. They are so inexpensive and so beautiful! We hung lots and lots of fuchsia and white lanterns and some big fluffy white pompoms around the dining space on the porch, including rows of lanterns over the tables. We also hung a few lanterns over the bar outside. 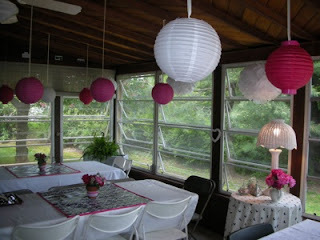 The lanterns made the space look so festive and pretty and infused color at every turn. Stay tuned for step-by-step instructions on how to do some of the DIY projects that we created for Sheila's shower in future posts. They're so super simple and fun! What are your favorite color combinations for bridal showers? Jamie and I have been loving the black-pink-white combos we've done lately. Do you like bolder colors or softer hues? Black & white? Or is that too stark for you? Color us curious -- we would love to know what you think! Maid of Honor Speeches, yay or nay? Surprise Showers, yay or nay?